, a minister of the church of Paris, and one of the ablest advocates the protestants ever had, was born at Chatelleraut, Jan 6, 1594; but carried soon after to Poitiers, where his father usually lived, on account of the office which he bore of receiver of the deposits there. His father designed him for business, and proposed to leave him his office; but his strong attachment to books made him prefer a literary education, and when his son had attained his eleventh year, he sent him to S. Maixent in Poitou, to learn the first rudiments of learning. He continued his studies at Poitiers, Chatelleraut, and Saumur; and, having finished his classical course in the last of those towns, he entered on logic at Poitiers, at the age of sixteen, and finished his course of philosophy at Saumur under the celebrated Mark Duncan. He began his theological studies at Saumur in 1612; which, says his son, was indisputably one of the most fortunate years in his whole life, as in October of it, he was admitted into the family of the illustrious mons. du Plessis Mornay, who did him the honour to appoint him tutor to two of his grandsons. Here, though he discharged the trust he had undertaken very well, yet it is said that he received more instruction from the grandfather than he communicated to the grandsons. 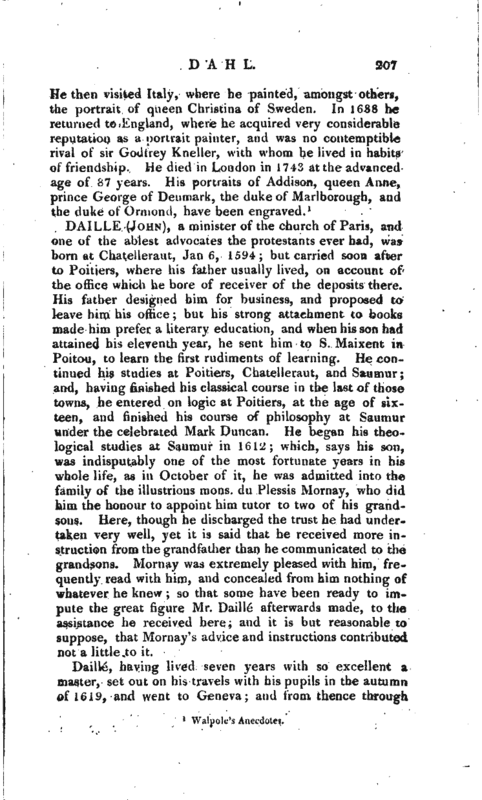 Mornay was extremely pleased with him, frequently read with him, and concealed from him nothing of whatever he knew; so that some have been ready to impute the great figure Mr. Daillc afterwards made, to the assistance he received here; and it is but reasonable to suppose, that Mornay’s advice and instructions contributed not a little to it. Daillé, having lived seven years with so excellent a master, set out on his travels with his pupils in the autumn of 1619, and went to Geneva; and from thence through | Piedmont and Lombardy to Venice, where they spent the winter. During their abode in Italy, a melancholy affair happened, which perplexed him not a little. One of his pupils fell sick at Mantua; and he removed him with all speed to Padua, where those of the protestant religion have more liberty, but here he died; and the difficulty was, to avoid the observation of the inquisitors, and remove the corpse to France, to the burial-place of his ancestors. 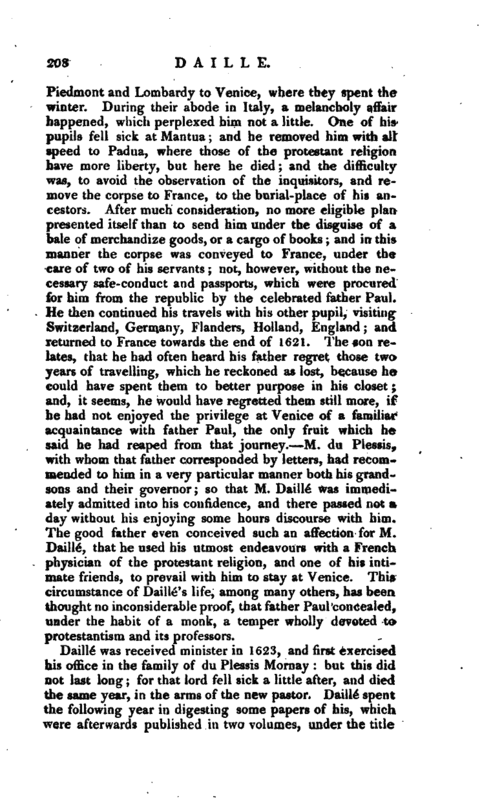 After much consideration, no more eligible plan presented itself than to send him under the disguise of a bale of merchandize goods, or a cargo of books; and in this manner the corpse was conveyed to France, under the care of two of his servants; not, however, without the necessary safe-conduct and passports, which were procured for him from the republic by the celebrated father Paul. He then continued his travels with his other pupil, visiting Switzerland, Germany, Flanders, Holland, England; and returned to France towards the end of 1621. The son relates, that he had often heard his father regret those two years of travelling, which he reckoned as lost, because he could have spent them to better purpose in his closet; and, it seems, he would have regretted them still more, if he had not enjoyed the privilege at Venice of a familiar acquaintance with father Paul, the only fruit which he said he had reaped from that journey. 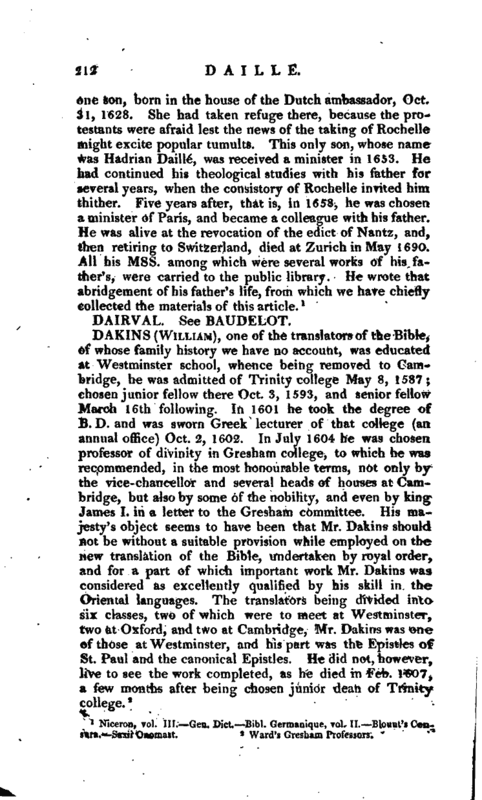 M. du Plessis, with whom that father corresponded by letters, had recommended to him in a very particular manner both his grandsons and their crovernor; so that M. Daille was immediately admitted into his confidence, and there passed not a day without his enjoying some hours discourse with him. The good father even conceived such an affection for M. Daille, that he used his utmost endeavours with a French physician of the protestant religion, and one of his intimate friends, to prevail with him to stay at Venice. This circumstance of Daille’s life, among many others, has been thought no inconsiderable proof, that father Paul concealed, under the habit of a monk, a temper wholly devoted to protestantism and its professors. 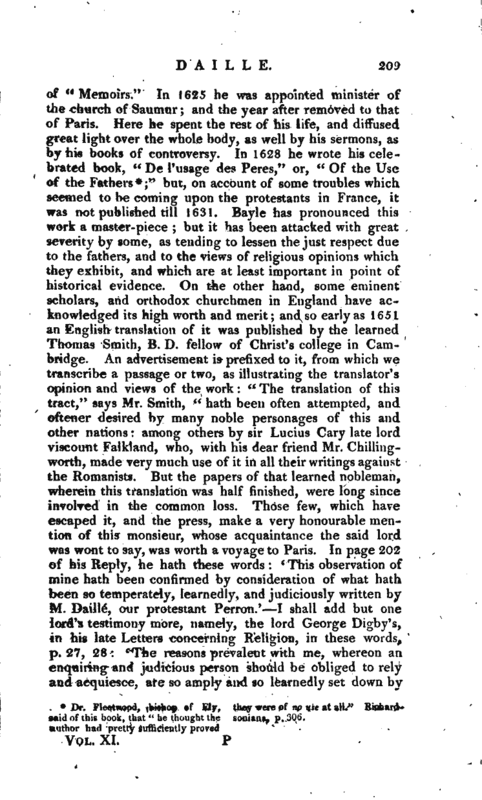 Dr. Fleetwood, bishop of Ely, said of this book, that “he thought the author had pretty sufficiently proved they were of no use at all.” Richardsoniana, p. 306. | M. Daille in his `Emploi des Peres,‘ that I think little, which is material and weighty, can he said on this subject, that his rare and piercing observation hath not anticipated.’ And for myself, I must ingenuously profess, that it was the reading of this rational book, which first convinced me that my study in the French language was not ill employed; which hath also enabled me to commend this to the world, as faithfully translated by a judicious hand.” Mr. Mettayer, who was minister of St. Quintin, published a Latin translation of this work; which translation was revised and augmented with new observations, by Daille himself, and was printed at Geneva in 1656. In 1633 he published another work of general concern, entitled “L’Apologie de nos Eglises,” or, “An Apology for the reformed Churches;” in which he vindicates, with much learning and argument, their separation from the church of Rome, from the imputation of schism, which was usually brought against them. This work was also translated into English by Mr. Smith, in 1658; as it was into Latin the same year by Daille himself, and printed at Amsterdam in 8vo. It was much censured by the clergy of France, as soon as it was published, and some were employed to write against it. Daille“wrote two or three little pieces in defence of it, which were afterwards printed with it in the Latin edition. That Daille was a very voluminous writer, will not seem strange, when it is considered that he lived long, was very laborious, and enjoyed a good state of health. 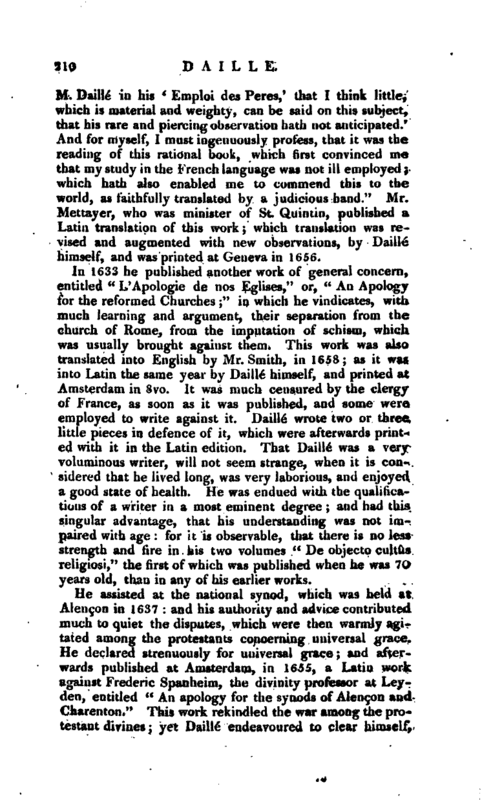 He was endued with the qualifications of a writer in a most eminent degree; and had this singular advantage, that his understanding was not impaired with age: for it is observable, that there is no less strength and fire in his two volumes” De objecto cultds religiosi," the first of which was published when he was 70 years old, than in any of his earlier works. He assisted at the national synod, which was held at Alengon in 1637: and his authority and advice contributed much to quiet the disputes, which were then warmly agitated among the protestants concerning universal grace. He declared strenuously for universal grace; and afterwards published at Amsterdam, in 1655, a Latin work against Frederic Spanheim, the divinity professor at Leyden, entitled “An apology for the synods of Alengon and Cbarenton.” This work rekindled the war among the protestant divines; yet Daille endeavoured to clear himself. | by saying, that his book had been published without his knowledge. Nevertheless, he answered the celebrated Samuel des Marets, professor of Groning-en, which produced a short, but very warm contest between them, in which Daille’s spirit of controversy has not been approved even by his friends. He died at Paris, April 15, 1670, having never experienced throughout his life any illness, except that in 1650 he was suddenly seized with a lethargic or apopletic disorder, in which he lay 10 or 11 days, apparently without a possibility of recovering. 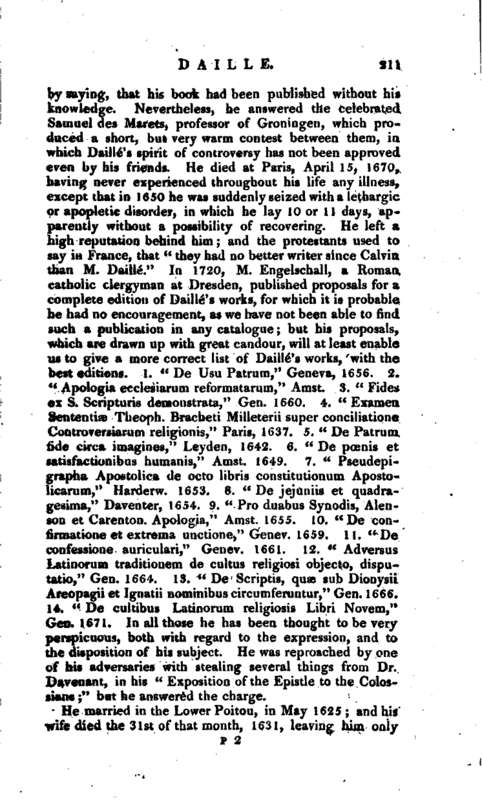 He left a high reputation behind him; and the protestants used to say in France, that “they had no better writer since Calvin than M. Daille.” In 1720, M. Engelschall, a Roman catholic clergyman at Dresden, published proposals for a complete edition of Daille’s works, for which it is probable he had no encouragement, as we have not been able to find such a publication in any catalogue; but his proposals, which are drawn up with great candour, will at least enable us to give a more correct list of Daille’s works, with the best editions. 1. “De Usu Patrum,” Geneva, 1656. 2. “Apologia ecclesiarum veformatarum,” Amst. 3. “Fides ex S. Scripturis demonstrate,” Gen. 1660. 4. “Examen Sententiae Theoph. Bracheti Milleterii super conciliatione Controversiarum religionis,” Paris, 1637. 5. “De Patrum, fide circa imagines,” Leyden, 1642. 6. “De pcenis et satisfactionibus humanis,” Amst. 1649. 7. “Pseudepigrapha Apostolica de octo libris constitutionum Apostolicarum,” Harderw. 1653. 8. “De jejuniis et quadragesima,” Daventer, 1G54. 9. “Pro duabus Synodis, Alenson et Carenton. Apologia,” Amst. 1655. 10. “De coniirmatione et extrema unctione,” Genev. 1659. II. “De confessione auriculari,” Genev. 1661. 12. “Adversus Latinorurn traditionem de cultus religiosi objecto, disputatio,” Gen. 1664. 13. “De Scriptis, quae sub Dionysii Areopagii et Ignatii nominibus circumferuntur,” Gen. 1666. 14. “De cultibus Latinorum religiosis Libri Novem,” Gen. 1671. In all those he has been thought to be very perspicuous, both with regard to the expression, and to the disposition of his subject. He was reproached by one of his adversaries with stealing several things from Dr. Davenant, in his “Exposition of the Epistle to the Colossians;” but he answered the charge. Niceron, vol. III.—Gen. Dict.—Bibl. Germanique, vol. II.—Blount’s Ceusura.—Saxii Onomast.